Part of the prize giving ceremony at the function in Nyali. 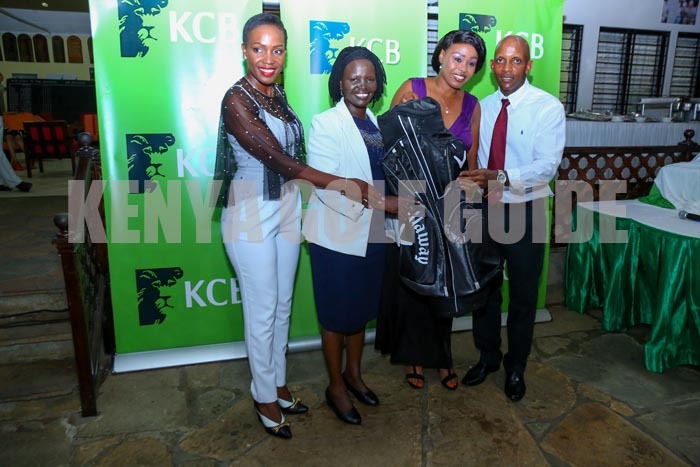 Former lady captain Joyce Masai emerged the winner in the second leg of the KCB Road To The Masters at the Par 71 Nyali Golf and Country Club. Handicap 12 Masai, who served as the Nyali Lady Captain in 2017, shot 43 stable-ford points made up of 21 in the front nine and 22 in the back nine. She leads the next lot of six qualifiers to the KCB Karen Masters Pro-Am which will curtain raise the Sunshine Tour sanctioned main event at the Par 71 Karen Country Club in June. Speaking during the prize giving, KCB Regional Business Manager Coast, Jane isiaho said: “As a Bank, we appreciate the assurance the golfing fraternity has on our brand. We believe in growing sports talent for local and international competition and by doing so, is our way of using golf to promote sports tourism in Kenya. I take this opportunity to congratulate the winners of this series,” she said. CJ Wangai of Sigona won the pro category taking home Ksh. 85_000. Second placed Greg Snow collected Ksh 55,000 while third placed pro Frank Matilo of Muthaiga took home 45,000. Other qualifiers are men’s winner Joseph Oluoch on 43 points,guest winner Fredrick Wagura handicap 19 of Golf Park on 38 and junior winner Andrew Wahome who had 38 points. Also in the Pro-Am mix is staff winner Ibrahim Lande who is also the KCB Bank Platinum Relations Manager. Handicap 26 Lande who is a member of Machakos club is incidentally the reigning Inter Banks golf champion. Thirteen year old Andrew is a sibling to Mathew Wahome who played as a junior in the 2016 edition of the Kenya Open. The sixth qualifier Abubakar Bajaber becomes the second winner of the wildcard which for second time running has been determined with a lucky dip of score cards returned to the “19th hole”. The men’s runner up award went to Abdallah Taib on 40 stable-ford points. The Lady runner up was Farida Saeed on 37. Longest drive best man was Allan Mola. Purity Mutinda won longest drive in the ladies category. Nearest to Pin honors went to Bharat Chavda. Best Effort (pigi mingi) went to Anthony Kariuki on 15 points. The first batch of qualifiers were ascertained at Sigona Golf Club during the first round of the series which didn’t feature professional players. Each of the 5 Legs of the series are being used as qualification rounds for amateurs who will play at at the Karen Masters Pro-Am. Six qualifiers will be selected from each leg where. 30 amateurs participating in the prestigious Karen Masters ProAm, which will be held at the Karen Country Club. The third round of the Road to the Masters heads to Thika Sports Club next month. This entry was posted on Monday, April 1st, 2019 at 5:32 PM and is filed under Golf News. You can follow any responses to this entry through the RSS 2.0 feed. Both comments and pings are currently closed.